When you drive, bike, or walk into different neighborhoods of cities you may sense something like: I belong here or in some cases, what am I doing here!? 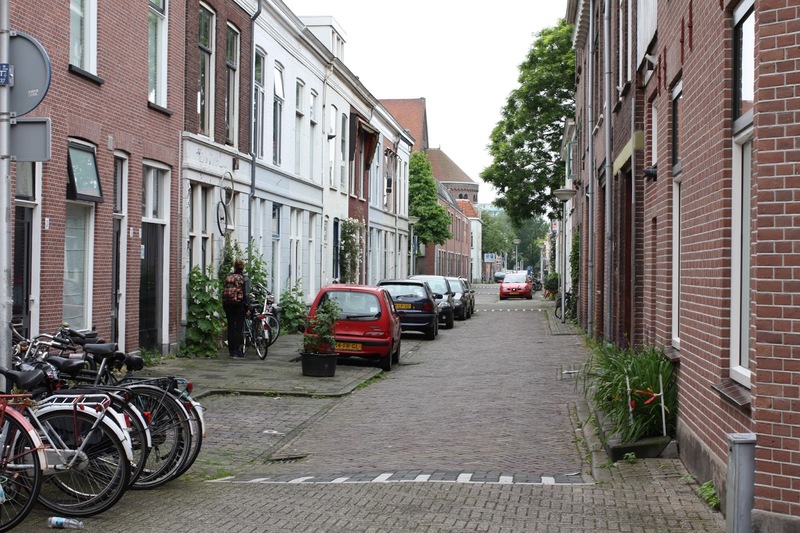 This episode discusses the human scale of neighborhoods in Delft. Later, I'll then compare these improvements to what's been established in Portland and remark on a opportunity area in Portland. Delft has deliberately been experimenting with human scale neighborhoods since the 1980s. Designs have been made where only pedestrians and bicyclists can traverse the area either by constraining the width of the path or discouraging through traffic. In this case, the Dutch have allowed pedestrian access all around the house by way of alleys and paths. The 1980 and 2000 developments had alleys behind residences which are also spaces used by the residences to park their bikes. The width of some of these alleys are approximately 5 feet with walls all around, which even makes cycling uncomfortable. These passageways are useful because some housing blocks are approximately 100 feet long, which provides a residence an opportunity to cut the extra walking distance in half (on average). Next, these cut-throughs are often combined with pedestrian only bridges over the canals, adding another level of connectivity. Such a pretty back yard eh!? I've learned everyone wants to have a canal on their property, go figure! 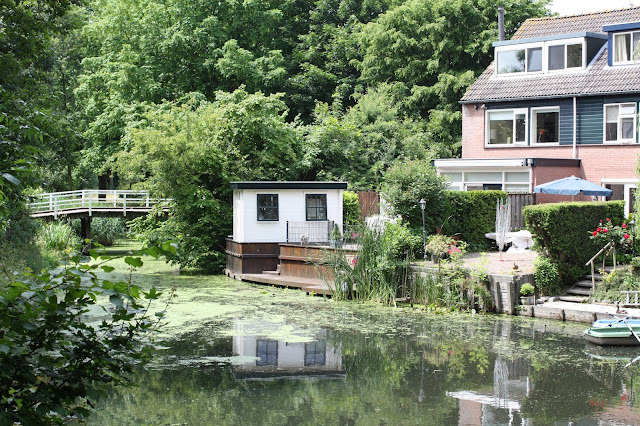 These canals also add value to their property. Furthermore, these bridges are meant for pedestrians only and prevent any possibility of vehicles entering. Lastly, pedestrian bridges are less expensive than vehicular bridges. So in this situation, the pedestrian bridge was a win-win. Also see below a more modern pedestrian bridge. 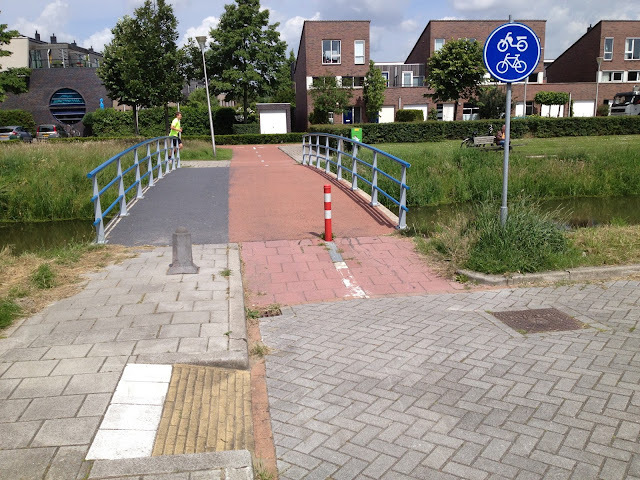 Note the bridge has clearly indicated where the pedestrians and bicyclists should be (Black color for pedestrians and red color for bicyclists). So, what does Portland do in these situations? We do have alleys in Ladd's and in northeast Portland. But where else are there opportunities? The biggest problem with Portland are the lack of large open lots of developable land in the inner City. The Delft developments were constructed in the 1960s+, whereas some Portland developments were erected in the early 1900s. So, we must be innovative, yes? I glance at NE Portland for opportunities to install alleys in the vicinity of the Alberta Street business district... But unfortunately, I doubt residences would allow a east-west alleyway through their block. So, I think scaling back the improvement from a pedestrian only improvement to an auto-light improvement could be appropriate. I think SE Yamhill street between 34th and 39th could be an opportunity to lighten traffic. 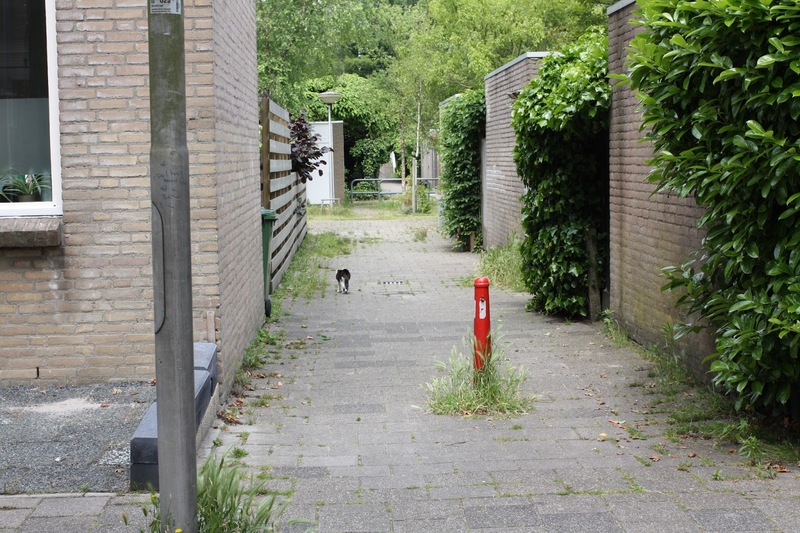 I'm thinking woonerf style like the following picture. One key aspect of this street is the alternating through-way of the street. You can see the parking on the left in the foreground and parking on the right in the background. Vehicles must turn to continue through the street. In the case of Yamhill, the cross-section is much wider than on this street. The woonerf style could be achieved by adding green space in the existing road to create deliberate obstructions and thereby reduce speed. Ideally, the addition of obstructions would not eliminate parking spaces. If need be, the existing parallel parking could be changed to perpendicular parking to increase the number of parking spaces while simultaneously creating obstructions to reduce speed. I'm sorry for the reader for taking quite a turn from the pedestrian level environment to then suggesting woonerfs. However, I believe there is difficulty with acquiring right of way for alleys in existing neighborhoods. Lastly, visioning more auto-light streets may help create the human scale developments such as depicted in Delft.